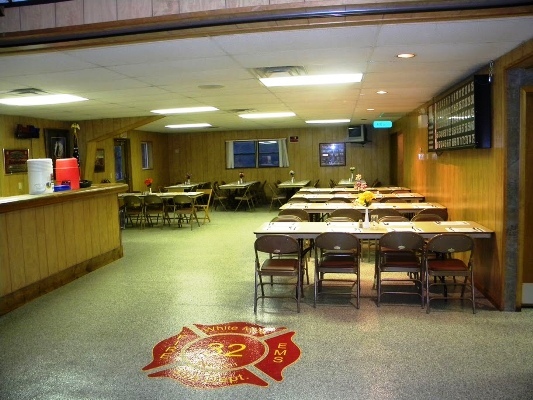 Hall consists of a large room and a bar room (annex room) with bathrooms attached. The large room holds 225 people maximum. There are 8 foot rectangular tables seating 8 people each. Rentors must provide their own linens. There is a full service kitchen available to caters with ovens and stove tops, along with a two door cooler, sink and a dishroom run by a member. The bar area consists of a 3 keg cooler tap system and a sink. No bar supplies are provided. There is a women's restroom with two sinks and three stalls. The men's restroom has one sink, two urinals, and two stalls. 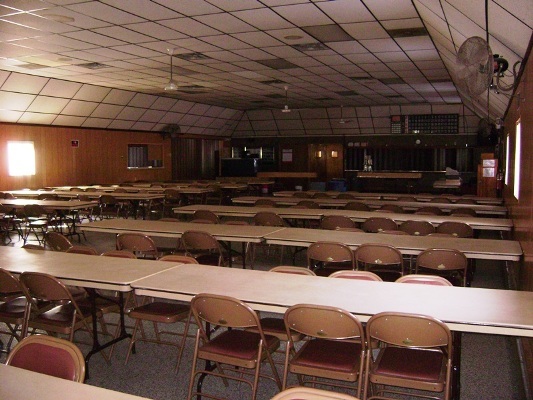 The hall is equipped with heat, air conditioning, and overhead ceiling fans. Ample parking is available along with handicapped spaces. Rental fees are based on the area being rented. For a wedding reception, the cost will be $600.00. One steward is required at a rate of $10.00/hr. Pre reception decorating and set up requires one steward at $10.00/hr. There is an additional $100.00 for the use of our dishwasher, plates and silverware. The diswasher will be operated by a member. A $100.00 deposit is due upon signing the contract to rent the hall. All functions must be complete by midnight. Renter must clean hall otherwise an additional $100.00 cleaning fee will be charged. Our smaller annex room is also available for rent. It can hold a maximum of 40 people. The cost is $100.00 for four hours, each additional hour will be an extra $25/hour charge. A steward is required at $10.00/hr. A $50.00 deposit is due upon signing the contract to rent the annex room. For more information or questions, please contact the department at (570) 253-4433. © 2019 All Rights Reserved. White Mills Fire Department. Website design by graphXevolution.